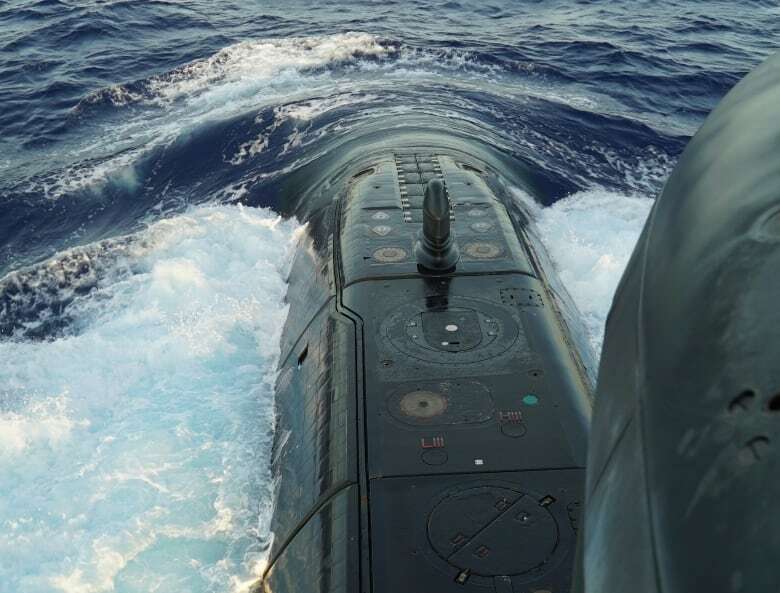 A rare look inside a Canadian submarine, HMCS Chicoutimi, as it conducts a surveillance mission in Asia-Pacific waters. HMCS Chicoutimi is on a 200-day deployment in Asia-Pacific waters to help monitor traffic in the region that might be trying to circumvent economic sanctions on North Korea. For the first time in 50 years, Canada has deployed a submarine across the Pacific. The secretive mission of HMCS Chicoutimi was planned more than a year ago, and involves re-establishing naval relationships with Asian nations. But it also comes at a time of escalating tensions with North Korea, as the country continues to push its nuclear weapons development program and the U.S. considers a pre-emptive strike on the country. As part of the international effort to enforce trade sanctions on North Korea, the Chicoutimi's mission in the region has included surveillance of vessels at sea, helping international partners monitor and enforce trade sanctions on North Korea. The seven-month deployment marks what the Royal Canadian Navy hopes is a turning point in the troubled history of its submarine force, purchased used from the British government in the early 90s. Heralded at the time as a sweetheart deal, the subs faced numerous costly failures over the following years. HMCS Chicoutimi itself suffered a flood while crossing the Atlantic in 2004 bound for Canada, and caught fire. One sailor was killed and the crippled sub had to be towed back to Scotland. Today, the Canadian subs have been refurbished and are operating off both the Atlantic and Pacific coasts. And in the Asia-Pacific region. CBC News had exclusive access to the largest, and longest, operation a Canadian sub has ever been involved in. Here's an inside look at what it's like aboard HMCS Chicoutimi as part of that mission unfolds. The Canadian submarine HMCS Chicoutimi arrives in an allied port in Guam after a surveillance patrol in Asia-Pacific waters. CBC News has agreed not to identify the sub’s current location, as it carries out classified operations in hot spots around Asia. (David Common/CBC)HMCS Chicoutimi is a diesel-electric sub that Canada purchased from Britain's navy and refurbished. The sub is on a 200-day deployment in the Asia-Pacific region, the longest and farthest from home of any Canadian submarine mission to date. Canada's submarines have operated close to home in recent years, but their crews have experience overseas. While Canada's subs were being repaired and rebuilt, Canadian sailors trained and served on the boats of allied nations. Chicoutimi's Commanding Officer, Cmdr. Stephane Ouellet, right, was captain of an Australian submarine and an officer on board a Dutch boat. He is one of just three qualified submarine captains in the Royal Canadian Navy. "Because of the nature of what we do," Ouellet says, "we can't celebrate our successes publicly. Our stealth is something we need to guard, but we are operating much more than any Canadian thinks." Subs are notorious for tight quarters. Aboard HMCS Chicoutimi, 58 sailors live and work in an area with about the same floor space as a three-bedroom house. The forward torpedo launching and storage area doubles as sleeping quarters. "Racks," or bunks, are stacked above and below powerful Mark 48 torpedoes, which contain 2,000 kilograms of explosives. Despite their destructive potential, the torpedoes can make it easier to get to sleep. They're cool to the touch, and sailors lie next to them for some relief when the boat heats up in the warm Pacific waters. The sub was originally built to operate in the frigid North Atlantic during the Cold War. On this deployment in the Pacific, water temperatures are routinely 25 C or higher — heating up the inside of the boat and challenging some of its onboard systems. The electric motors of submarines are designed to run silently, but the diesel engines that charge the Chicoutimi's batteries are extremely noisy. The engine-room crew requires hearing protection when the diesel engines are running. Master Seaman Anna Whiten is a weapons tech, responsible for maintaining the torpedoes and counter-measures. She's the sole woman serving aboard Chicoutimi on this mission. There is no room on the sub for privacy, and unlike other navies, Canada does not segregate its crews. Whiten sleeps in the same cramped space with the men in the crew. "There are no real differences between sailing on a submarine as a woman or a man," she adds. "The living conditions are the same, the qualifications are the identical, the pay is identical." The captain is the only member of the Chicoutimi's crew who gets private (albeit tiny) quarters. With difficult living conditions, in tight quarters with the same people for weeks at a time between port visits, meals are seen as key to morale. Inside this small kitchen, the two cooks (one with a coveted Red Star certification) prepare impressive dishes for the entire crew. After a week at sea, the fresh food has been used and the cooks have to get creative with canned and frozen ingredients. Space limitations mean there's no big dining area and meal times have to be staggered. Breakfast begins at 3 a.m., dinner at 7 p.m. There are three small toilets on the Chicoutimi for the 58-person crew. There are two showers — to conserve water, they are used only briefly and not every day. Sanitary waste is jettisoned periodically into the water, but only if the vessel is far from any land and in deeper water. To ensure the sub is quiet underwater, sailors secure any part of the boat that will vibrate or create sound. The outside surface of the submarine is smooth, with rubber tiles to absorb sonar pings. The ultimate aim: Don't be seen, don't be heard, remain undetected always. The role of a submarine is to be secret and, above all, to not be detected. The periscope is used for only a few minutes at a time to minimize the chance of being seen by ships on the surface. On the current mission in Asian waters, the Canadian crew watches for suspicious activities, like transfers or cargo or oil between ships on the high seas, that could indicate vessels are breaking international trade sanctions. The sub's crew also watches for "patterns of life." That includes monitoring harbours to determine what vessels leave and when they return. "Whatever ship or object we're observing, they're unaware of the fact that we're there. And that is a huge bonus, because then they're not going to stop what they're doing," says Lt. David Hendry, the Chicoutimi's combat officer. On this deployment, the crew is also conducting exercises with navy vessels from other nations. From the bridge in the conning tower, Oulette speaks with a French frigate the Chicoutimi had been tracking. When Chicoutimi identifies suspicious activity on the water, in a harbour, or surveilling an airport from the sea, it sends encrypted messages to Canadian officials who can quickly share that information with allies on the surface. Other vessels or aircraft can then be sent to intercept, ensuring the sub remains unseen. Whether submerged or on the surface, the steering is done without seeing. When diving, detailed maps and sonar are used to plot a course. On the surface, sailors must watch from the conning tower and relay any orders by radio to the control room. HMCS Chicoutimi has crossed some of the most remote waters in the world to conduct its mission off the coast of Asia. 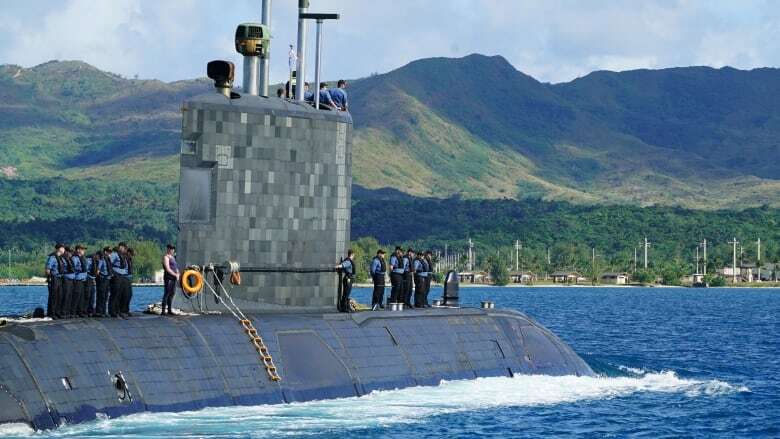 During its current deployment, the sub has visited Japan, Hawaii and the U.S. territory of Guam. About half the crew will remain for the entire 200-day voyage. Others have been swapped out, while select trainees have joined for legs of the voyage before they are permanently assigned to another submarine. HMCS Chicoutimi is expected to return to Canada's Pacific Coast in March 2018.